According to Chinese astrology, each year (starting from Chinese New Year) is associated with an animal sign, occurring in a 12-year cycle. For example 2015 is a year of the Goat. Goats, 2015 is an important year for you according to zodiac theory. It is your Ben Ming Nian. 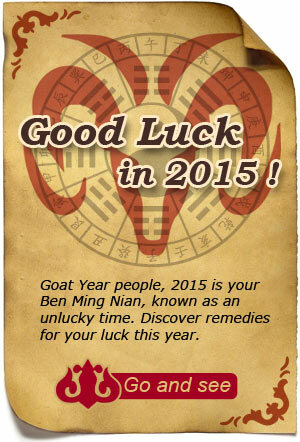 See How to Bring Yourself Good Luck in Your Ben Ming Nian. People born in a year of the Goat are generally believed to be gentle mild-mannered, shy, stable, sympathetic, amicable, and brimming with a strong sense of kindheartedness and justice. They have very delicate thoughts, strong creativity, and perseverance, and acquire professional skills well. Although they look gentle on the surface, they are tough on the inside, always insisting on their own opinions in their minds. They have strong inner resilience and excellent defensive instincts. Though they prefer to be in groups, they do not want to be the center of attention. They are reserved and quiet, most likely because they like spending much time in their thoughts. Goats like to spend money on fashionable things that give them a first class appearance. Although goats enjoy spending money on the finer things in life, they are not snobbish. People born in a year of the Goat are very serene and calm. Therefore they tend to have fewer health problems. If goat people are in mental and emotional good spirits, this should have a positive effect on their physical health. Eating fresh and organic produce, and eliminating red meat from their diet when possible, is an effective way to keep healthy. They should get out among nature and commune with the great outdoors. Fresh air, trees, and sunshine will all do wonders for their health. Goat people should have a regular schedule for meals and keep their sleep and waking times consistent. People born in the year of the goat prefer to work in a team. Their best work partners are Horses. They are not crazy about status and power. Unless asked, they won't ever volunteer for anything and act as leaders. Good career choices for goats are pediatrician, actor, daycare teacher, interior designer, florist, hair stylist, musician, editor, illustrator, and art history teacher. How to Build Relationships with "Goat People"
Generally speaking, Goats are private. Therefore it may take time and effort to get to know those who are born in a year of the Goat. Goats seldom share their personal lives. This is the reason why most Goats have few intimate friends. Once they become friends, their friendship is peaceful and fulfilling. They work hard for those they love. The Luckiest Things for "Goats"
These things are believed to be unlucky for Goat people. Unlucky colors: green, blue, and black. Goat people should avoid wearing these colors. Worst lunar months: third, sixth, and tenth. Avoid these months if you have some important business to do or want to plan an event. Is Goat Year 2015 a Lucky Year for "Goats"? 2015 is a benmingnian (本命年 /bnn-ming-nyen/ 'origin life year' or zodiac year corresponding to one's birth year) for people born in a year of the Goat. In Chinese culture, a year of one's birth sign is unlucky. Love and relationships: Married Goats will get along well with their spouses and will enhance their relationships through daily quarrels. Single Goats will find their lifelong love under the guidance of elders, however they should show more care for their partners in order to avoid family disputes. The propensity for good fortune will not be very good for those born in a year of the Goat, and they will easily become involved in financial difficulties. Therefore, they should adopt conservative strategies when dealing with investments. They should try their best to increase their income, decrease their expenditure, and live within their means. Lottery fans should restrain themselves from gambling too much in order to avoid big losses. How to Make Your Career Path Smoother in 2015? People born in a year of the Goat generally have a smooth career, and will readily get help from wealthy beneficiaries. They usually be able to avoid adverse situations. Many opportunities for promotion, cooperation, and investment await them. However, they should deal with problems concerning their partners properly to avoid acrimony. 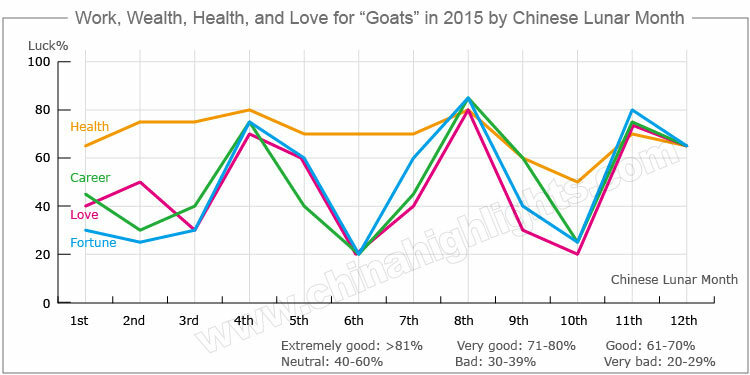 How Can Goats Have Good Health in 2015? Is it a Good Year to Give Birth to a Baby? There is a popular Chinese folk saying 'Only one out of ten people born in a year of the Goat finds happiness' (十羊九不全), which means most babies born in a year of the Goat are destined for failed marriages, unhappy families, and bad luck. Most Chinese people also believe that babies born in a Goat year will grow up to be followers rather than leaders. Therefore many Chinese couples take steps to avoid having children in a year of the Goat. Many young Chinese couples have been trying desperately to conceive, racing against time to have a baby in the 2014 year of the Horse, which is considered far luckier than a Goat year. Although this is an outdated superstition which seems silly, it has a real effect on Chinese society. What Type of "Goat" Are You: Wood, Fire, Earth, Gold, or Water? In Chinese element theory, each zodiac sign is associated with one of five elements: gold (metal), wood, water, fire, or earth, which means that e.g. a Wood Goat comes in a 60-year cycle. Wood Goat 1955, 2015 Amicable, gentle, and compassionate. Fire Goat 1907, 1967 Amicable, frank, and honest, always making everything clean and tidy. Earth Goat 1919, 1979 Righteous, honest, straightforward, and will never harm their friends. Gold Goat 1931, 1991 Ambitious and kind-hearted with a strong sense of responsibility in work; sometimes too stubborn. See 2015 Predictions for Goats of Different Elements. Actually, Chinese people are also not quite sure about that. In Chinese the word 羊 (yáng) is a generic term, and can refer to a sheep (绵羊), goat (山羊), ram/buck (公羊 male sheep or goat), 羚羊 (antelope), etc. 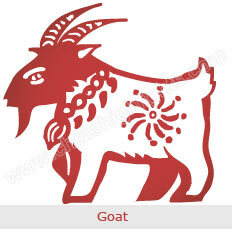 There is a lack of clear definition on the zodiac "Goat" in Chinese history. Firstly, the Chinese zodiac is an invention of the Han Nationality, and goats were widely raised by the Han people (unlike sheep), so the zodiac animal is more likely to refer to a goat. Secondly, a Goat image often appears on Chinese zodiac stamps, New Year paper cuttings, and New Year paintings (not a sheep). Thirdly, the Goat was one of the 12 bronze statues of the Chinese zodiac at the Old Summer Palace. Although its head was lost, its present reproduction according to historical records is the image of a goat.